COMING SOON: A completely new format, optimized for use on any device! Q. What TYPES OF HAIRSTYLES does the Hairstyle Changer offer? Q. Can I set an AUTOMATIC HAIR COLOR for all hairstyles to appear in as I try them on? A. Yes, plus the Catalog itself! Click the "Hair Color" icon in the left control panel to access the color chart (see images at left) and use this time-saving feature, which will also display the entire Catalog Gallery in your selected hue on a model of your choice (you can have those Emo styles come up purple as soon as you click them). You can also switch colors on the fly or revert back to non-default -- and even change highlight colors with the Highlights Chooser (see right). Q. Is it possible to SAVE a finished image for retrieval later? A. Just select "Save to Favs" on the lower left panel. Favorites can be viewed (click the icon on the left panel), added or deleted in seconds, and you can print, or share your images three different ways. The Auto-Color feature is easy to use. Just choose a default hair color from the chart, and the catalog gallery instantly updates. It works for all types of styles for both women and men. Reverting to original color for the style you're trying on will also show the original colors of the styles in the gallery. Mouseover any gallery thumbnail to reveal the original photo plus information. Q. What type PHOTO OF MYSELF should I use, and how do I upload my picture to my private gallery? A. Use a head-and-shoulders photo, looking directly at the camera, with your hair pulled back from your face, and ears uncovered -- this way you can try on any type of hairstyle! Make sure your snapshot is focused, clear and well-lit. A plain white background works best. To upload: Log onto your account and click the "Add Photo" icon in the left panel (jpg format, at least 200 x 250 pixels, and less than 1 Mb). 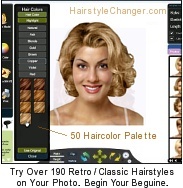 The Hairstyle Changer includes a photo editor to optimize your picture; the adjustment controls at the bottom lets you fine-tune the positioning if needed. Q. In the Makeup Palettes, how do I get the LIPSTICK and EYE MAKEUP to fit perfectly on my photo? A. Click the "Align" tab on the Makeup panel and use the tracing tools (see image at left). Tracing is not needed for the Blush and Foundation. Q. Can I upload MORE THAN ONE VERSION of my photo? Q. I'm a guy. How do I see hairstyles for MEN? A. Click "Change Models," pick "Male," or upload your own picture. Then click the "Hairstyles" icon, choose "Men's Hairstyles," then click "Continue," and pick the textures and lengths you want, click "Show Results" (or use the "Try On" icon in the hairstyles information area, outside the Changer). Q. Will MORE hairstyles be added? A. Great new styles of all types are added regularly! Q. What HAIR COLORS in particular does the Changer offer? A. The Hair Changer's Hair Color Chart offers dozens of popular hues that wear many names: Black/Brunette, Red (Burgundy, Ruby, Ginger, etc. ), Brown (Caramel, Bronze, Chestnut, Mocha, Hazelnut, etc. ), Blond/Blonde (Platinum, Sandy, etc. ), Gray/Grey, Violet/Purple, Gold/Golden, Autumn, Auburn, Ash, Copper -- in tones ranging from Light to Medium to Dark. It's an online hair color app with 4000+ hairstyles! Q. Does the catalog include any RETRO hair looks from the past? Q. 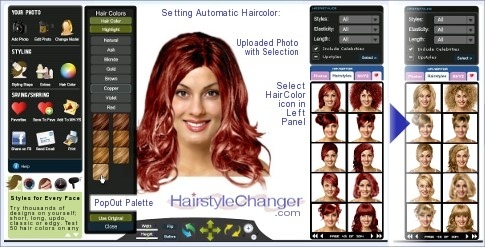 Can the Changer AUTOMATICALLY find the best hairstyles -- and hair colors -- for my FACE? A. Certainly! Access Wizard mode by clicking "Hair Consultations" -- and in moments, try hairstyles & colors based on your face shape, eye color, skin tone, desired length and other specifics you enter (wear glasses?). For guys, too! There's also options for updo and formal -- the Wizard even matches styles to the formal dress you'll be wearing (spaghetti straps? lace? asymmetrical?...). The Changer can alter the suggestions any way you like! Q. Where do I choose MODELS until I upload my own photo? A. On the left panel, click "Change Model" and select male or female (see images at right). And when you upload, remember that you can add multiple versions of yourself! Q. What if I have more QUESTIONS or need HELP? A. For help anytime, click the blue "Help" button in the left panel -- there's also a customer service department ready to assist you. 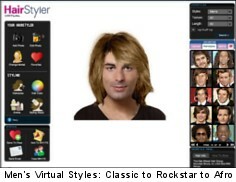 Most styles also include styling steps for home perms. You'll find that the Hairstyle Changer is a snap to use -- have a blast and get in touch with your inner corporate president (or punk rocker)! This comparison tool offers a virtual hair changer for any need (styles for Asians, Indians and Blacks/African-Americans,looks & ideas such as popular, stylish, current, fringe, bob/bobbed, front/side bangs, upcurls, downcurls, upsmooth, downsmooth, very short/long, mid-length, hairstyles that make you look younger, traditional, modest, touseled, cute girly, upswept, pretty, boho, messy permanents, braided dreadlocks, drop curls, thick, thin, hairstyles for mature women, cool looks for mall fashionistas & trend mavens, for glamouristas and glamouristos (or glamoristas and glamoristos), easy styles for recessionistas, looks for different types of foreheads (tall, wide, high, low, etc. ), and designs for any face shape: round, diamond or heart, oval, skinny/slim/slender/narrow or fat, oblong, rectangular, triangle/triangular, square, plus prom, bridal, funky, updo, modern, celebrity, Afro, fashion, beauty, swag, shob, formal, trendy, hot, cool, cute, botticelli/spiral/corkscrew curls, lob, hairstyles for older women, body wave / hair permanent waves, close-cropped, flattering haircuts & hairstyles for women over 50, for women over 40, for women over 60, women over 70 & women over 30, ultra-straight, upstyle / semi-upstyle, commercial modeling industry, movies, tv, etc. 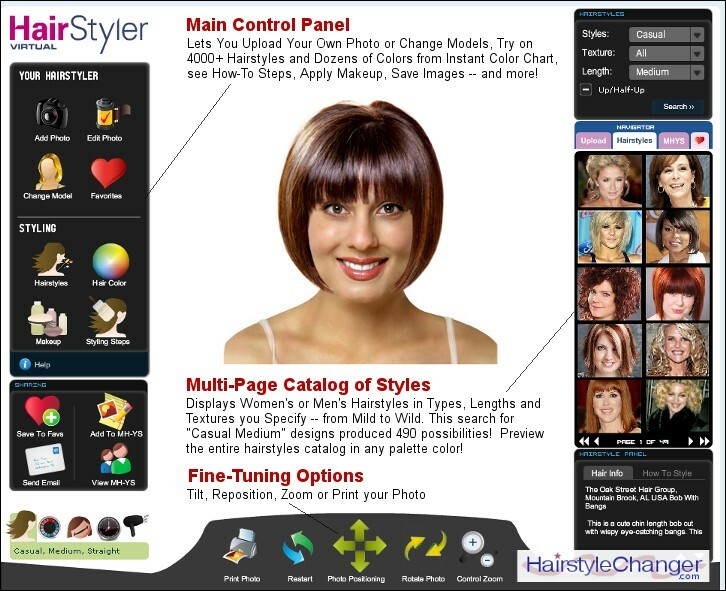 ), and helps test, change, create, find, select, choose, view, visualize, make, try out and change hairstyles and haircolors or design your own hairstyles, which displays different digital simulations and possibilities of virtual hairstyles, hair dos (or do's), hairstye colours, pictures of hairstyles and online virtual representations of hairtyles, plus hairdos and haircuts which visitors can use for makover possibilities and vitual hairdo styling makeovers at a hairdresser/hairstylist salon or at home -- how-to steps (setting, teasing, blowdrying, etc.) show use of items like gel, smoothing shine, wax, moisturizer, lacquer, hairspray, balm, mouding cream, mouuse, sculpture lotion, diffuser, blow dryer, curling iron, comb, radial brush, and straightening iron (such as Sedu, Farouk, Chi) or flatiron (an online application/app, gallery catalog, library or visual list/advisor/helper, providing options/examples/suggestions from search specifications), and does not provide any other service or advice (no software download or free games) - and the wizard mode's quick quiz helps you find the color and hairstyle that suits you best -- and most styles incldue tutorial tips for diy home hair styling. Visitors can get registration details to upload their own face picture, photo or photos and try out a wider makeover selection gallery of hairsyles, haircutting possibilites and hairsyles combinations for hairstyling ideas and perm solutions and perfecting their image for an ideal hair makeover look -- or simply compare and change hairstyles, and seeing before how they would look after a new perm, with a wizard option for instant possibilties.